Badwater Basin. This is considered to be the lowest elevation in North America and, according to some sources, in the whole Western Hemisphere (other argues there is a location in Argentina which is actually lower). The original lake dried up about 3000 years ago, but the area is occasionally flooded by the heavy rain. Why Badwater? As the original colonists passed through, one of the donkeys wanted to drink water out of one of the small ponds, but refused, cause for the colonists to exclaim “this is Bad Water…” – salty and undrinkable. Except an interesting landscape of salt flats. Artist’s Drive and Palette. The name pretty much says it all. A 9-mile detour from the main road is worth it because of the incredible colors of the rocks that make it a delight not only for a professional artist. The colors are due to the presence of metals in the rock and their oxidation. Furnace Creek. Since you are in the desert, you need to come by an oasis as well. This is it! The oasis has a great lodging facility and if you have driven from Los Angeles or Las Vegas, it would be a good idea to use it. However, choose the Ranch rather than the Inn, which is much more expensive and, additionally, is closed for the summer. The rates are generally from $128 to $179 in the summer and up to $213 in the winter. Among the things you can do here is golf (if you want to try golfing in the desert), enjoy the local bar (with occasional live music) and stargazing during the night. Zabriskie Point. The view from here is worth the trip, but it is not unique. You should go to Zabriskie Point because of the underlying cultural meaning, including as part of the cover of “The Joshua Tree” album by U2 and the name of a movie by Michelangelo Antonioni. Dante’s Peak. You should definitely finish your tour, because this is a good place for a farewell to the valley. The peak is about 5000 feet (about 1700 meters) above sea level and it is the place where you can look at your humanity in the face. 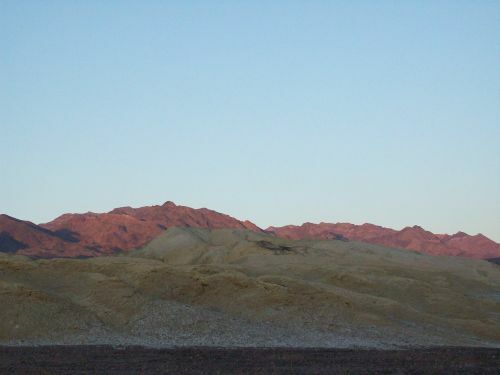 The overlook of the valley covers your entire circuit of sites to include Badwater or the Artist’s Drive, but you have an overview of the entire landscape, of the mountains surrounding it and of the former lake. Wait, that’s not all: there are dragonflies around! It may not seem like much when you read these lines, but once you are up there, face to face with that scenery, they actually matter.